A bit of an offbeat "space filler" for one part of my layout ! 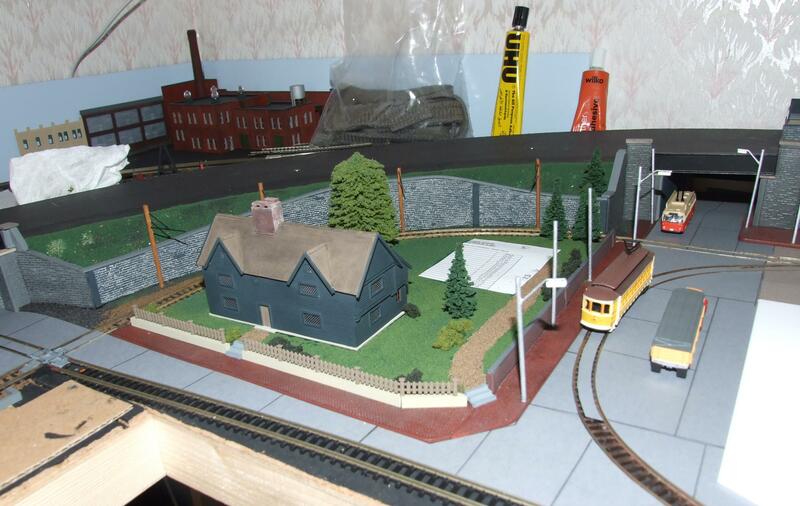 I have a 3" wide raised area against the backscene on part of the "Federal Hill" area of my layout that wasn't really wide enough for a buiding of any sort, so, after some thought, I decided to make a suitable monument to fill the space. The column and base is a scale 70' high, the base being made from plasticard and the column from two bus ticket roll plastic centre tubes(! ), the whole lot being covered in Superquick OO scale grey roof tile sheeting. I had a rummage around in the 4mm scale figures that I had to hand and found a very elderly whitemetal casting of what appears to be a Tram/Bus conductor figure, mounted on a thick circular base which fitted the bill perfectly. The figures pose is a bit too "Comrade Ulyanov addresses the Proletariat" for the USA, but it sets the monument off OK.
Will most probably add a visitor viewing platform at the top of the column, like the Baltimore version, plus some other detailing/notices before it finally gets fixed to the layout. 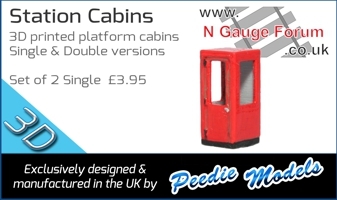 Excellent use of orribly oversized resources for the real gauge! I've now reached the stage where I am running out of suitable buildings off previous layouts to "recycle" for the new one so I have to turn to completely scratchbuilt ones - which is where the "fun" begins ! 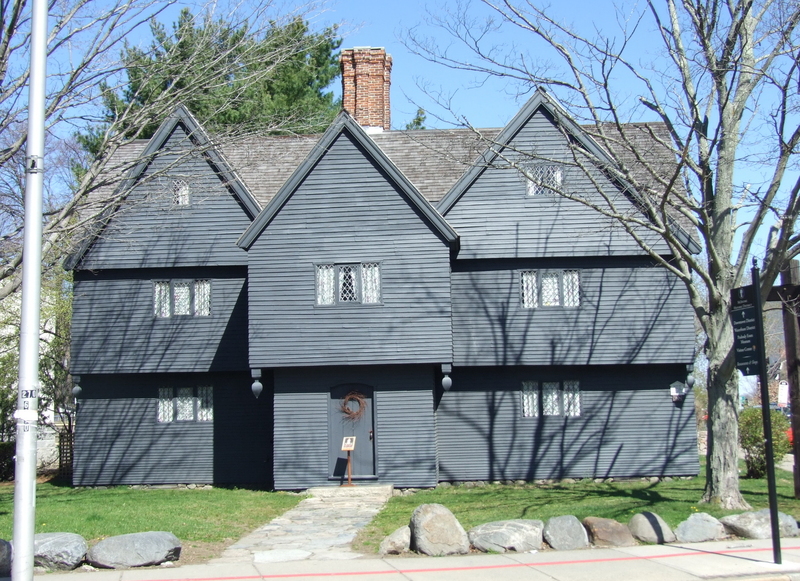 The oldest parts are thought to date from 1680, possibly earlier, but it has been altered many times over the years and has now been reconstructed back to how it is thought to have appeared in the late 1600's. 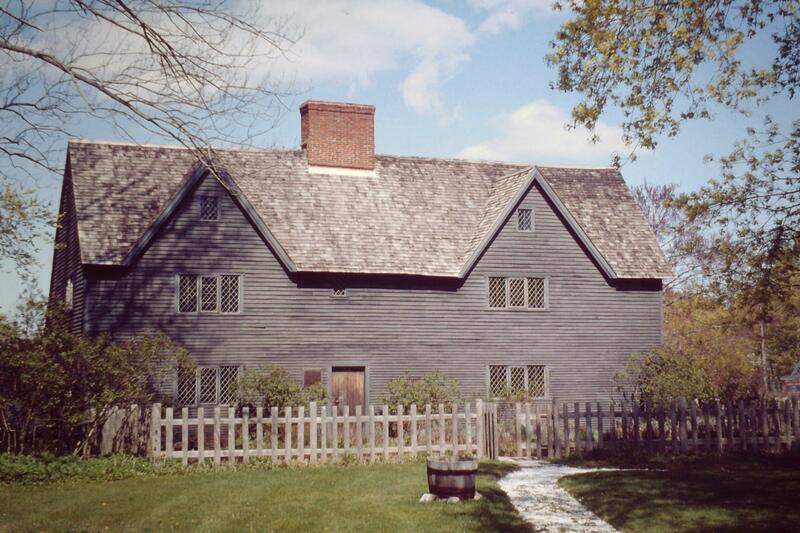 It has actually been a museum since 1899 and was moved about 3/4 mile, by road (in one piece!) in the 1920's to its present location. 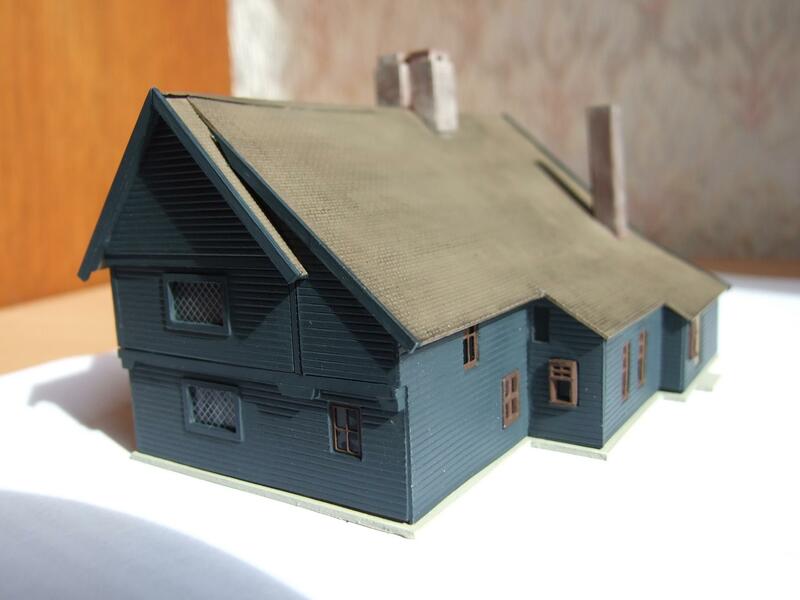 I had taken a couple of photos of the building in the past, and even had a tour inside, but not sufficient to work out all the dimensions/window placements etc for a model. Luckilly, putting the buildings name in Google comes up with a large number of photographs of the place (plus lots of others that aren't even of it...) which was sufficient to draw up some rough sketches and calculate approximate dimensions in order for a series of scale drawings to be concocted. 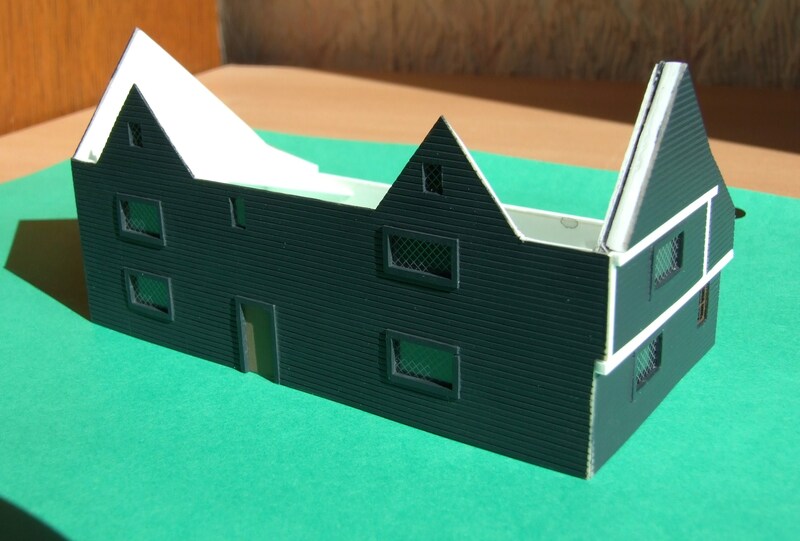 Some alterations have been made to the model in that dimensions have been tailored to the space available, and the windows have been simplified - particularly the leaded main ones. Slaters 1mm planking sheeting has been used for the main cladding, whilst the leaded windows are from the Freestones Model Accessories sheet L02. The panes of glass are slightly too large, but the effect they give is what I wanted. The east end gable on the house has been the biggest headache, as the real thing has some odd angles in places, but it seems to be coming together OK. The roof is equally going to be difficult to get right (or rather the bits not shown in the photo above). so I'm about half way through the construction now. Good start. It's going to look great! It's actually the first scratchbuilt model of a prototype structure that I have ever made in N, though have made a few in OO and G (1:24) in the past. It's not an exact copy - but certainly captures the feel of the original. How uber cool is that. Well done, Sir. Can't wait to see it on the layout! And more gables on the next one? Awesome! Well done, Sir. Can't wait to see it on the layout! The white paper template sitting adjacent to it is where the next scratchbuilt one will be going, when I get round to it. This section of the layout is still a building site ! 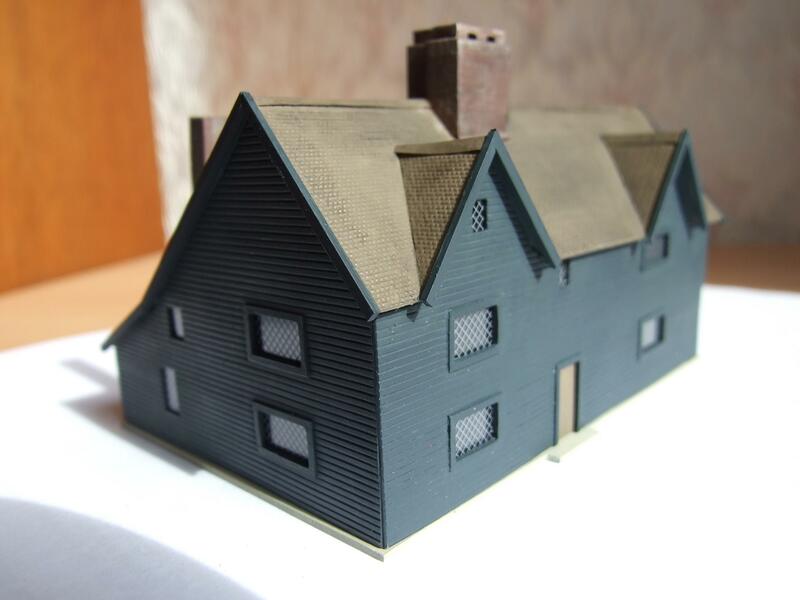 It is going to be placed adjacent to the John Whipple house, as marked by the paper rectangle shown in the previous photo. Will be a few weeks before I can get round to starting work on it as I am currently sorting out the track laying and associated ballasting/scenic dressing on baseboard #3 on the layout, not to mention photographing some more suitable modelling subjects, in situ, in the near future! I have been looking at working a coal yard & unloading point in on the layout and was originally just going to have a ramped section of track leading to coal drops below. In the end, the place earmarked for that was used for something else, so it was going to be left for a location on one of the other two, unbuilt, baseboards. However, I've recently altered part of baseboard 1 and added an extra section to the edge, giving room for a couple of extra sidings - one of which will serve a coal unloading point. 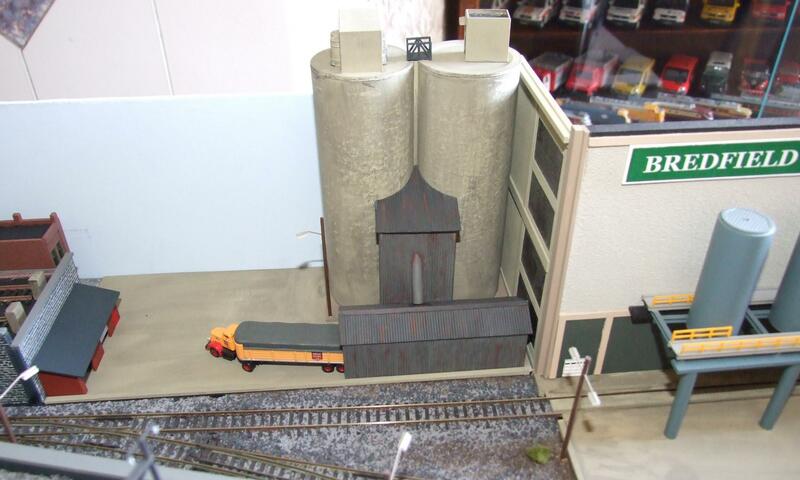 The simple "coal drops" have been replaced by purpose built coal storage silos - a system that seemed popular in North America compared with the usual style of rail served coal merchants yards you found here in the UK. 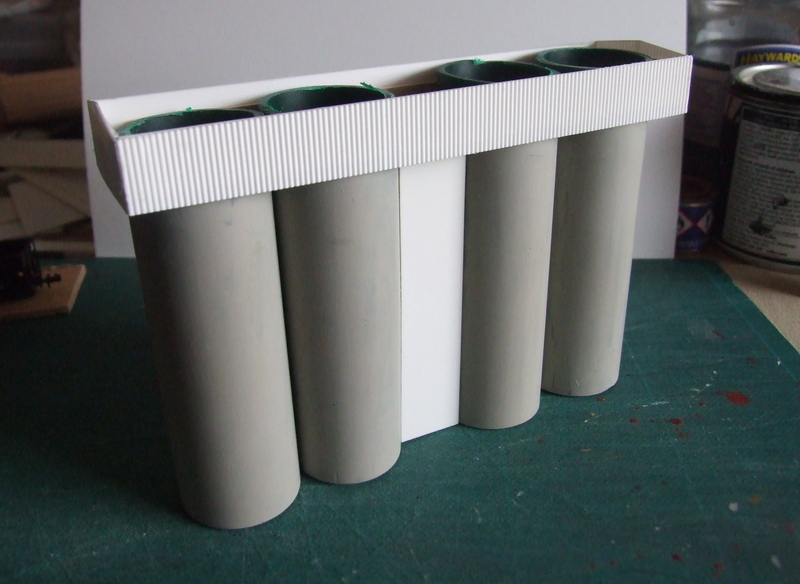 I had a search on the internet and found lots of prototype photos so have started building a freelance structure based on those.. The silos themselves are cut down sections from a vacuum cleaner pipe and odd bits of plastic sheet are being used for the rest of the structure. Obviously there is a lot to do to finish it off yet, but the picture shows its general shape. As one side of it is going to be up against the backscene, I don't have to worry about detailing that side too much! The photo shows the "layout" side of the structure and the centre, white section, will be the location of the elevator to carry the coal from the wagon unloading point. Walthers certainly do something like this in HO - not sure about N - but mine is going to be a lot cheaper to produce and it is tailored to the location as well! Wondering what you were up to! Kitbashing a G Scale interurban car as well at the moment, which was a job I started some time ago and was "paused" for longer than anticipated! Silo now complete, but signs still to be produced and added to the structure. 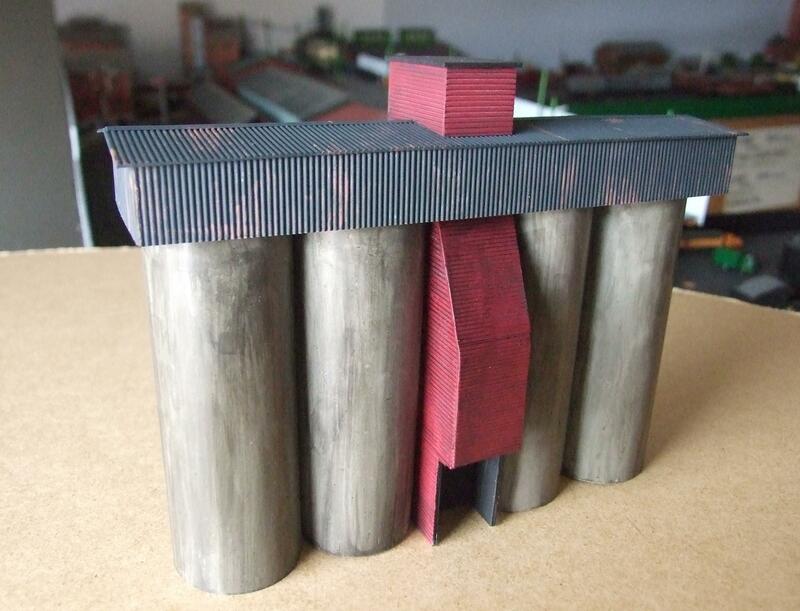 Will need to produce some ancillary buildings to go with it, as well as the coal unloading point as well. However, I've recently restarted some work on the "add on" section that incorporates the coal depot and an extension to the grain terminal. This pair of silos were constructed about 25 years ago(!) from a couple of talcum powder containers. They were originally rail served on the previous layout(s), but this time are part of a larger complex, so they have been reconfigured as a road vehicle loading point. Still some more work to do to them, but they fill up a corner of the extension. The elevated coal delivery sidings for the coal yard are off to the left of the photo. 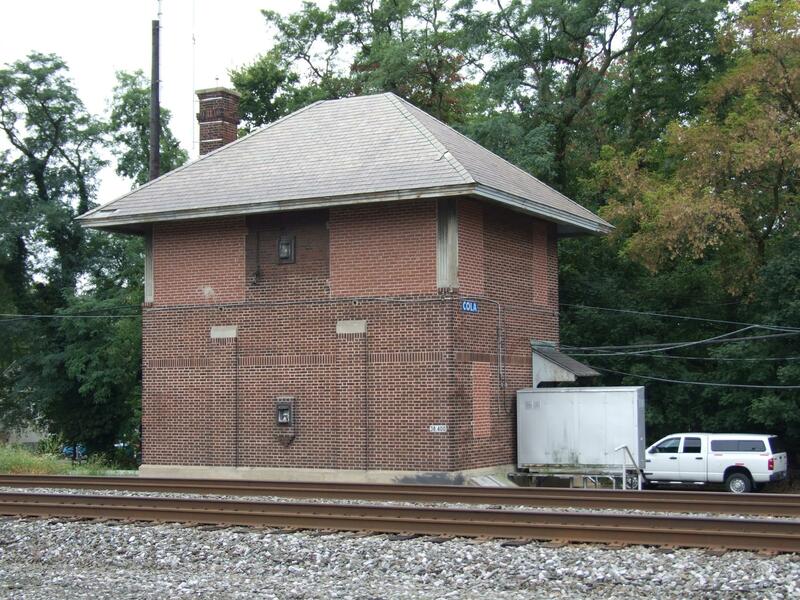 Having finally finished (after 2 years....) the G Scale Interurban car mentioned a few posts ago, I've moved on to the next N scratchbuilding project - A Pennsylvania Railroad Style Signal Tower for the main line tracks on the upper level of the layout. Will most probably end up having to build another one at some stage as well. It ceased to be use for its original purpose several years ago and all the windows were bricked up, but a quick search on the internet produced several photos in its former state. Some of the brass etched Ratio window frames I have are ideal for this, so that dispenses with having to scratchbuild any windows! The PRR tended to have fairly standard designs for signal towers, so a "generic" style isn't going to be out of place on my layout. It would be good to see a pic of it in its former state, if you can oblige please.